Philip Hammond, the Chancellor of the Exchequer, delivered a Budget which he declared “shows the British people that their hard work is paying off”. Mr Hammond wasunder intense pressure to loosen the purse strings. He did announce several new cash injections, while suggesting that “the era of austerity is finally coming to an end”. The Chancellor began his statement by revealing the latest economic forecasts from the Office for Budget Responsibility (OBR) which showed a significant improvement in the public finances. from 1.3%. Growth forecasts for 2021 and 2022 were maintained at 1.4% and 1.5% respectively, and a new forecast of 1.6% was unveiled for 2023. This was the Chancellor’s final Budget before the UK leaves the EU; Mr Hammond stated that we are currently at a “pivotal moment” in the Brexit negotiations and confidently predicted that the UK will build a new future outside the EU. He also announced that an extra £500m was being set aside for preparations for leaving the EU and reiterated that next March’s Spring Statement could be upgraded to a full Budget if required. In addition, he announced plans to make e-passport gates at Heathrow and other airports available to visitors from the US, Canada, New Zealand, Australia and Japan as well as EEA citizens. However, it’s fair to say that the subject of Brexit did not exactly dominate his Budget Statement as some prior media speculation had suggested, although he did announce the introduction of a commemorative 50p coin to mark the UK’s departure from the EU. announced separately, on 12th December 2018. The lifetime allowance for pension savings will increase in line with CPI for 2019/20, rising to £1,055,000. 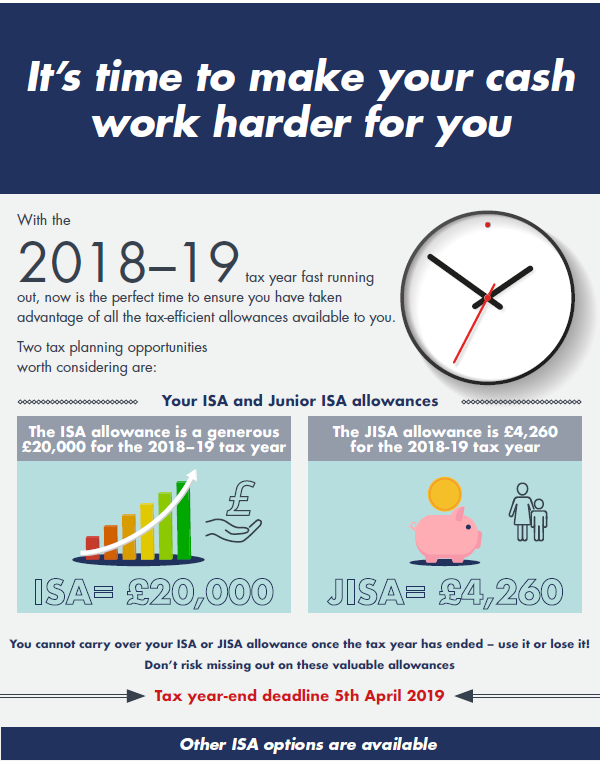 The ISA subscription limit for 2019/20 will remain unchanged at £20,000 and JISAs will be uprated in line with CPI to £4,368. 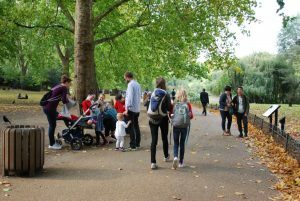 The Government is set to publish a consultation next year for maturing Child Trust Fund accounts and on the taxation of trusts. Mr Hammond also said that the National Living Wage is set to increase by 4.9%, from £7.83 to £8.21 an hour, from April 2019, and that work allowances for Universal Credit were to be increased by £1,000 per annum, a move which would see 2.4 million working families with children, £630 a year better off. The Chancellor also announced a freeze in fuel duty for the ninth successive year, and that beer, cider and spirits duties were also to be frozen. Wine duty is, however, set to rise in line with RPI inflation, while tobacco duty will continue to rise by RPI plus 2%. 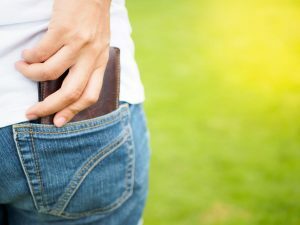 In an effort to address pensions cold-calling, the Government is publishing a response to its consultation and will shortly be implementing legislation to make it illegal. The Department for Work and Pensions will consult later this year on supporting the launch of pensions dashboards, allowing people to view their pension pots, including their state pension, in one place. They also intend to publish a paper outlining the Government’s approach to increasing pension participation among the self-employed. Another key announcement related to the Private Finance Initiative (PFI), with the Chancellor saying there was compelling evidence that such contracts do not deliver value for taxpayers or genuinely transfer risk to the private sector. He therefore stated that all future PFI contracts are to be abolished although he did stress that the Government will honour existing contracts. The Government welcomes the FCA’s plans to expand access to the Financial Ombudsman Service (FOS) to small and medium sized enterprises, along with its consultation on increasing the FOS award limit to £350,000. last Budget on 22 November 2017. The Chancellor also announced plans to add £500m to the £5bn Housing Infrastructure Fund that was designed to help get a further 650,000 homes built, along with new housing association partnerships in England that would deliver a further 13,000 homes. From April 2021, a new Help to Buy Equity Loan scheme will run for two years, available to first-time buyers only, for homes with a market value up to a regional property price cap. Please note, these key points – particularly in reference to NHS and housing funding – may not be applicable in Scotland. tailored investment advice and is for guidance only. Some rules may vary in different parts of the UK; please ask for details. currently applying or proposed and are subject to change; their value depends on the individual circumstances of the investor.